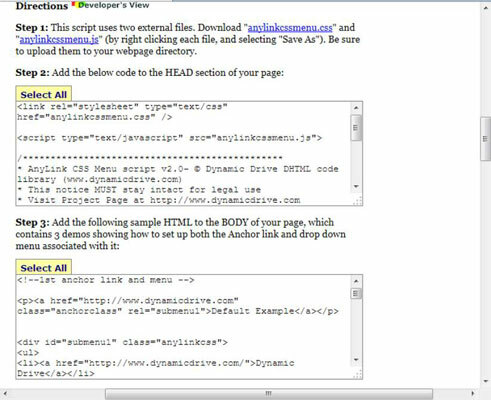 Many of the scripts provided on the Dynamic Drive site work with jQuery and jQuery UI CSS3. They’re extensions of a sort that help you use these two APIs with greater efficiency. The location of the jQuery and jQuery UI CSS doesn’t change. Some of the scripts provide custom CSS files that you must download and place on your system in order to use the script. These links can be hard to see at times. 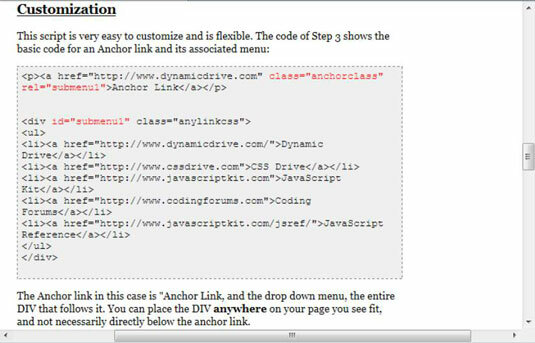 In this case, you’re looking for the anylinkcssmenu.css link in Step 1. Dynamic Drive tends not to provide a hosted link that you can use to access either the CSS or associated script. You can choose to modify the custom CSS directly, or provide changes to the CSS with internal or inline CSS modifications. The important thing to remember is that you need the downloaded file to make the script work properly. Make sure you look carefully at all of the materials for a particular Dynamic Drive script. In many cases, you see a Customization section. This section provides insights on how you can customize the script to meet specific needs.